GRENOBLE, FRANCE—Quebec is home to the largest cycling network in North America: La Route Verte. 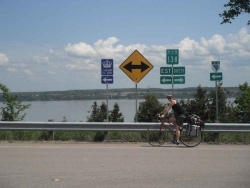 Inaugurated in 2007, it connects over 4,000 kilometres of bike routes linking the many regions of Quebec: from Gatineau to Gaspé, and from the south of Montreal to as north as Val-d’Or, Lac-Saint-Jean and Baie-Comeau. This past summer I cycled over 1,100 kilometres from Montreal to Gaspé to see why over four million people rode this trail in 2010. “When we began the project, the concept was to link up all the regions in Québec with their cycling paths, so that everyone who always wanted to travel by bicycle could have access to it,” says Louis Carpentier, director of development for the Route Verte. “The other goal was to have something to join the environmental movement—something without motorized activities, something greener.” Now more than ever, Quebecers—especially those living within five kilometres of their workplace or school—are using their bikes as their mode of transportation. Biking focuses on a healthier lifestyle, choices that have positive impact on the environment and community, and of course cycling is simply a fun activity. Though the concept is shared widely across Europe and North America, cycling is far more about the local region, explains Carpentier. The Route Verte not only diversifies the regional economy, but it influences the creation of new attractions. Richard Goulet from Maskiongé is one such entrepreneur. He reopened the general store dating back to the mid-nineteenth century as a museum and café. Items such as tin containers, radios and toy cars are only a few examples of what sits on the shelves and behind the display cases. Along the Route Verte there are countless examples of small businesses geared to cyclists. Sylvie LeBeault from Yamachiche renovated her house to include a take-out window to sell ice cream. A sign tells visitors to ring the bell. I did, and LeBeault comes right down. "Cyclists need both rewards and motivation,” says LeBeault, as she hands me a strawberry ice cream cone. As it stands now, the Route Verte is 94 percent complete, edging close to its initial goal of around 4,300 kilometres of bike paths. Their main focus for the immediate future is reaching that goal, and improving the signage along the route. An area that needs improvement—one obvious for anyone who has driven on the roads in Quebec— are the pot holes that line the bike paths. Carpentier admits that this is the most common complaint he receives. However, the Route Verte relies on their regional and provincial partners for road maintenance, and thus must be patient while the government decides on construction. The Route Verte has resulted in a wider impact on life in Québec than solely providing a safer environment for cyclists. Statistics have shown that more and more Quebecers, young and old, are using their bikes for pleasure, transport, exercise or vacation, and the numbers have been growing consistently over the last decade. The concept of cycling networks is also growing worldwide. Just as the Route Verte looked to European networks, its creators are now being consulted by Australia and Ontario. As the concept expands to encompass more regions, countless local communities are benefiting along the way. The Route Verte stands as an example of how big ideas implemented locally can result in a contagious flow of positive effects for the environment, economy, and lifestyle. Crossing borders for stories, Michael Sabelli is in constant motion while he captures what's happening in the world in words.